Let's face it, looking at your upcoming wedding expenses can be daunting. As you may know, this past June, my younger brother, Sam got married to his lovely wife, Emily. My mom and I were in charge of mostly everything; decor, food, planning and coordination, and I can say, a bit of planning helped them move through the major expensive decision so that they made it to the wedding day with everything, including the budget, in order. Things like invitations, cake, flowers and such, can all be expensive but one of the bigger expenses is always the cake, which I will focus on here. When it came down to the nuts and bolts of the getting the cake, Sam and Emily really couldn't care less about having a lavish 8-layer tower extravaganza. However, they did want gourmet flavors as opposed to the standard buttercream frosting, bleh. They wanted the divine Tiramisu with silky, melt-in-your-mouth cream frosting; the Chocolate Chip layered chocolate cake with yummy chocolate whipped cream frosting, etc., etc. You get the picture. They were all about flavor vs. presentation. Which was fine, but left me trying to make their budget work with the gourmet price. I could easily have fit one of the available wedding cake packages in to their budget, but it meant they were only going to have either a 2-tower (10" bottom and 6" top) gourmet wedding cake, plus two smaller side sheet cakes for around $300, or a 3-tier (10"-8"-6") and no side cakes for about the same price. Not really much for your buck, and we needed more cake than that. This is when Sam and Emily told me that maybe we could do something different with the cake rather than ordering one of the wedding packages, because they didn't really care about having a tower-style cake arrangement. Planning & Comparing Cost Saving Ideas. Here's where the creative part had to work. I came up with a brainstorm after Emily mentioned that a regular order for an 8" gourmet cake was only $18-26. All I needed was an attractive and inventive way to lay out the cakes. There are plenty of bakeries doing these sort of designs but using lots of floral (more floral ups the expense so I kept thinking). The goal was to do something that would present the multi-tier the cakes in a nice presentation. You could discuss with your bakery about different options, but I ended up with certain things I had to just deal with with no work-around. For example, what the cakes would come on. Talking to the bakery I found out that any standard ordered cake comes on a gold, scalloped edged cardboard base, bleh, again. Trying to eliminate that part, I found that other options would cost at least $90 per 8" round cake (we needed 3). One option would get the cake delivered on a 'wedding cake base' - which consisted of a 1/2" thick plain cake board. This would have been nice, but not for the $60 jump in price. I then asked if I could supply them with my own materials as a base that they could make the cake on. I was told this was okay and I placed the order. I would have the cakes placed on thick plexiglass circles. Two weeks before the wedding I called to confirm and remind them that we were going to do this. This is when I found out from the main baker/designer that due to the health codes I wouldn't be allowed to provide my own material - so out the window that went. I was back to dealing with the gold cardboard. 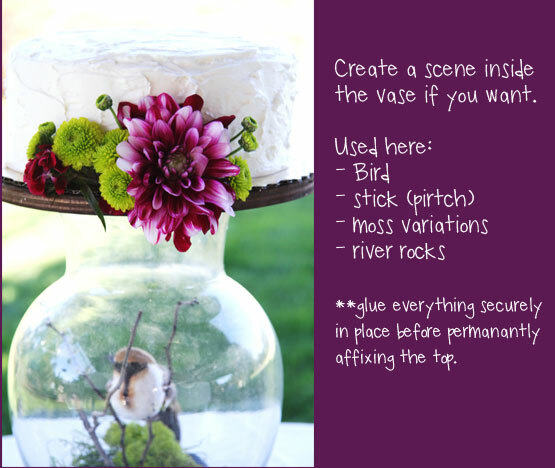 I realize this is wordy, but I want to share my process so that it may help you along your decisions and different directions you can go with making the cake hundreds of dollars cheaper. The Vision Coming to Life. I had access to building tools and materials via my Mom and Dad's shop, so that helped. If you don't have any access to a shop via friends or family, some cities have public shops available for time/tool rentals - ask your local hardware stores about this. For the base, I had decided to put the cakes on 1-inch wooden rounds, stained a dark walnut-ish colour. The cakes were going to be 8-inches around, with a 9-inche gold cake-board each. I decided to make the wooden rounds about 10-inches. 1.) Cut the rounds as round as you can (use a compass or 10-inch plate to draw them out). 2.) Sanding the edges will definitely help soften any rough looking angles around the edges. 3.) Wipe the wooden circles clean with a tack cloth or dampened rag. 4.) Apply your wood stain or paint (whatever finish you have decided to use). For the supports. I needed something that would look neat and not be too extravagant, because the cakes were going to be fairly plain looking. I wanted something rustic but a bit contemporary, and I needed a way to stagger the height height of each stand. I decided to go with two varieties of drinking glasses and a vase. 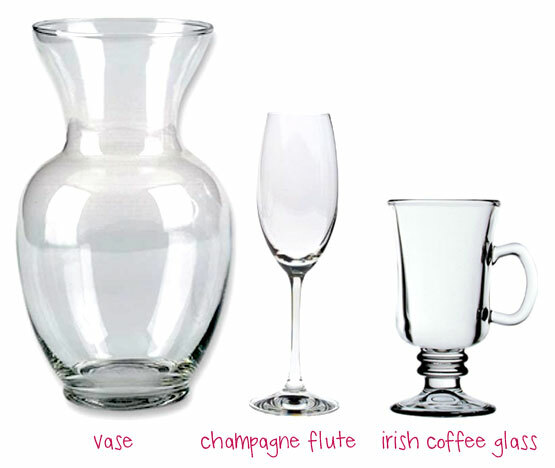 I used a large bubble vase that we already had sitting around, and picked up three champagne glasses and three Irish Coffee Glasses. The vase I kept upright and the glasses I put top-down. If you are looking to get a vase just like the one I used... I googled "clear glass vase" and got this result from FloralSimplicity.com, so you can see this is a standard variety at any floral shop. So, if you cannot find one via family, friends or your local thrift shops - ask your local florists how much they would sell you one for. 1.) First I wrapped twine around the necks of the champagne glasses each separately (using a knot and hot glue to secure and finish off the twine wrapping). 2.) Then I connected-wrapped the Irish Coffee Glass handles with twine (I needed to balance the twine-wrapped elements and it helped stabilize the heavy glasses). 3.) Lastly, I hot glued the glass bases to the wooden cake bases. 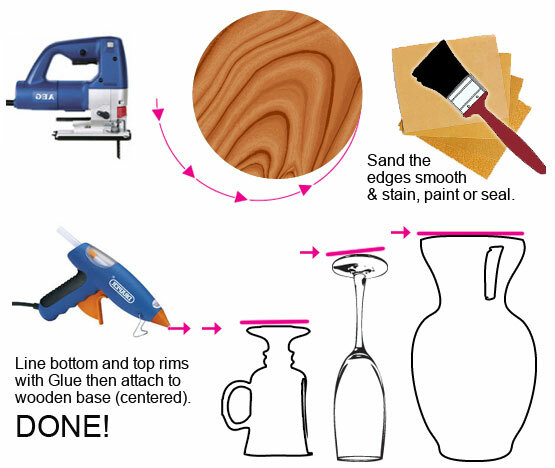 Find out where the center of your wooden bases are, add glue to the glass base rims. You might even lightly trace with white chalk where you want the placement of the glass rings before adding the glue. 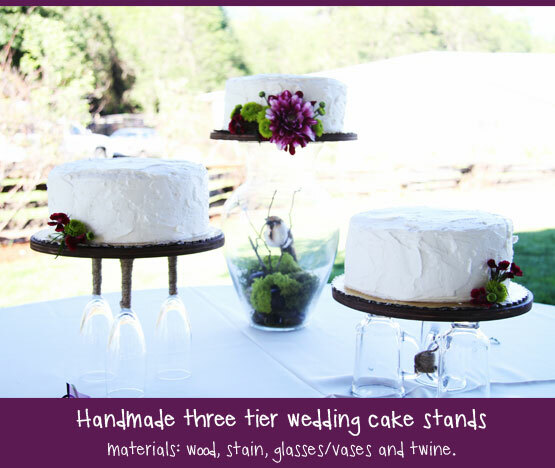 *note: see the twine wrapped glasses above in the photo with all three cakes in it. Final Touches. Sam and Emily didn't have a preference for a cake topper (of course), so I decided to go with an all-floral design, keeping it consistent with the wedding flowers. 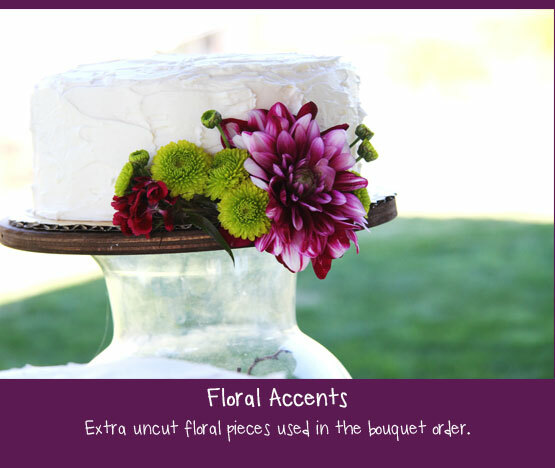 I had two ways of doing this, the first was to get the tops made by the florist we were using. This was going to cost I think $8 or so for each top and included an oasis bowl for the fresh flowers to sit in and everything. Not too expensive, but in the bigger picture spending another $25 was not what I wanted, so I opted for my second option, ask for extra stem flowers of a sturdy variety. Using those we cut each stem to about 4-inch and wedged them in simple arrangements for each cake. Notice the main, top cake has a bigger arrangement than the other two. You might also notice the scene going on in the large vase. I had decided that since we were not doing a cake top, I would make a "cake bottom". My arrangement consisted of glossy river rocks, two types of decorators moss, a stick from the woods and a bird from the craft store. Altogether, a reasonable $10 or less. You can find the moss and river rocks at craft stores, but also check your local dollar store--where we found both the rocks and moss, or dig in the woods and river. Cake Setting Notes: The original idea of using plexiglass would have been cool, but as I called around to get some custom-cut rounds the price started going up again. My cheapest option was $15/each. So that would have made our $26 cakes $41 each. Not completely a necessary expense. If the gold foil cardboard piece is too ugly for you, try covering the entire round with a floral vine, decorative paper or fabric element (twisted fabric maybe). Cake Frosting Finish Tips: Luckily I found out that I could get a different finish than that of a standard cake piping (the kind you see on pre-made, ready-to-buy cakes in display cases for birthdays and occasions). I asked about different piping designs and it started costing more (getting in to the wedding cake design costs again). So I asked simply for a "rough spatula finish" - you can see the result on in the images of the finished display above. I could have gotten a frosting-smooth minus pipping (or with it, which I didn't want) or this sort of rough look. So ask your bakery about different options that won't up the cost. This look to me, made the cake look classy, and didn't look like they went with a cheap over-the-counter cake. Vase Acquiring Tips: As mentioned, if you have your mind on a certain type of vase and you cannot seem to find it at your local thrift shops or you want to save yourself some time, call around to local florists to see how much a single vase might cost. Gluing: I originally used hot glue to secure the glass supports to the wood base, but you could use other types such as Gorilla Glue or Super Glue or even go as far as to router cylinders 1/8-inch into the bottom of the wooden rounds as well. Ideas I haven't tested. The hot glue holds well but doesn't show a nice smooth finish - which ultimately is not even seen. MAKE SURE YOUR CAKES ARE ON A NON-WOBBLY SURFACE - SECURE THE TABLE. Since they are precariously balanced on glasses and vases, make sure 100% that the table is secure. @caori yeah sorry I completely spaced mentioning that you can use the glass plate method. :) For this wedding, the wood worked out beautifully. You might even be able to convince a baker to use the glass plates instead of the gold cakeboard too. :) Thanks for the comments. it is striking. My daughter is getting married in the next year so this is timely for me. I'm with you on the cake, that is a much better choice.